Wait, this isn't Monday...so why is the designer challenge being posted?? Ture, I am a little off on dates occasionally, but this one is intentional. We are posting the challenge a day early because we have a special week ahead. The theme for December is last minute gifts. And this week we will be showing you gifts all week long during our Scor-pal/Jillibean Soup week! Before we get to December, we need to announce the winner of the November challenge. November's winner is Nina R.
We will be changing things up a bit for the new year so Nina will be getting a Scor-Tape package and be featured by Scor-pal in January. Now for the December Scor-pal Designer Challenge. This month's Challenge is Last Minute Gifts. Create a project using your Scor-pal to create a last minute gift. One project will be chosen by Scor-pal. The winner will receive a Scor-Tape prize pack and be a featured designer in January. To be eligible for the prize, projects must not be entered in more than 2 additional challenges, link back to this post, list Scor-pal in your supply list and show either step outs, explain how the Scor-pal was used or give a link to the tutorial used. 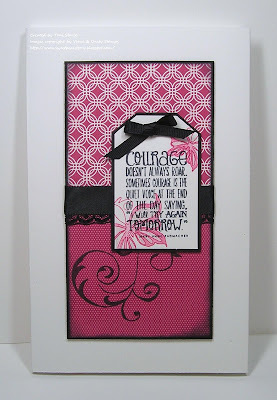 I was chosen to be December's Guest Designer and this month's theme is "last minute gifts". This is surely 'the challenge' for me, as I do lots of things at the last minute. This covered notepad is really quite easy to do. The first time I made one of these, it took me less than 45 minutes. I'll break down the steps for you here. You'll need a 5" x 8" junior legal pad, 3 pieces of card stock (8 1/2" x 11", 5" x 8", and 2 1/8" x 5"), your Scor-pal or Scor-buddy and some strong adhesive. I used Scor-tape on my project here. Step 1: With your 11" side of the 8 1/2" x 11" sheet of card stock on top, score at 4 1/8", 9 1/4" and 9 1/2". 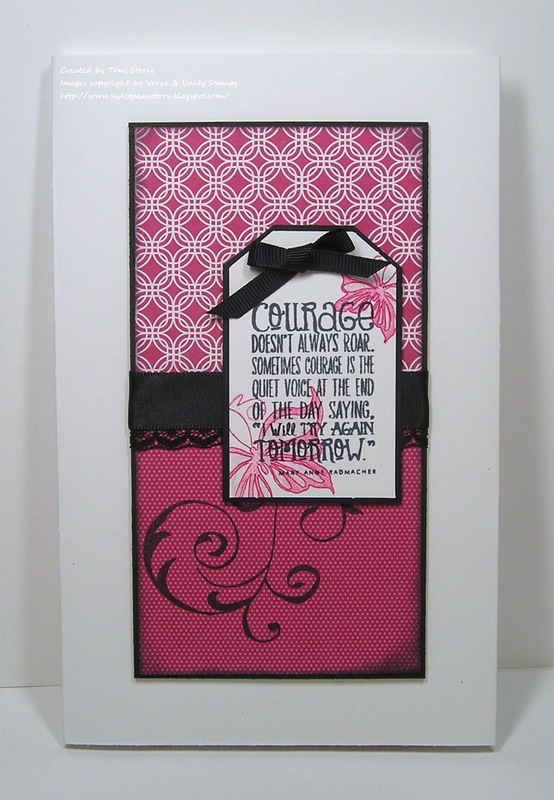 Place the 8" side of your card stock on the top and score at 1/2". Trim off the shaded portions above. Step 2: If you prefer to stamp the base, now is the time to do it. Then, burnish your score lines. Step 3: With the 2 1/8" side of the 2 1/8" x 5" piece of card stock on top, score at 7/8" and 1 1/8". (I used my Scor-buddy and scored at 7/8", then slid that score line over to the 1" groove and then scored at 1 1/4"). Step 4: Burnish the score lines on this piece and adhere to the top of the junior legal pad with the 7/8" section on the front of the pad. (This photo shows how you are covering up the label on the legal pad). Step 5: Adhere the 1 1/2" x 8" section of the largest piece of card stock to the back of the legal pad. Step 6: Fold flap up and adhere to the next section on it's right (which measures 5" x 8"). You have now created a pocket and the front cover of your note pad. Step 7: Adhere your 5" x 8" piece of card stock to the back of the notepad for a finished look. Step 8: Embellish as desired. I want to give credit for this design as it is not my own. I first encountered this covered notepad through Virtual Stamp Night on Splitcoaststampers. It was featured in a May 2009 Virtual Stamp Night challenge. The design is originally credited to Julie Ebersole. Thanks for reading all the way through my first tutorial. I hope you enjoyed it and have a fabulous day! Details - Stamps: The Artist In You (Unity Stamp Company), Blue Skies (Verve); Paper: Whisper White, Basic Black, Thoroughly Modern dsp; Ink: Momento Tuxedo Black, Rose Red; Accessories: Black Satin ribbon, Black Lace, Black Grosgrain ribbon, SU tag sheet, Sakura Clear Star gel pen, sponge dauber, glue dot, stampin' dimensionals. This is lovely!! Well done. The notepads we get here usually has garish covers. This is a beautiful alternative. Great project and perfect gift!!! Hi Gals, I am so glad I found you. I have never entered before and had a great time making my project. Thanks for hosting! Visit the Scor-pal fan page for more prizes! 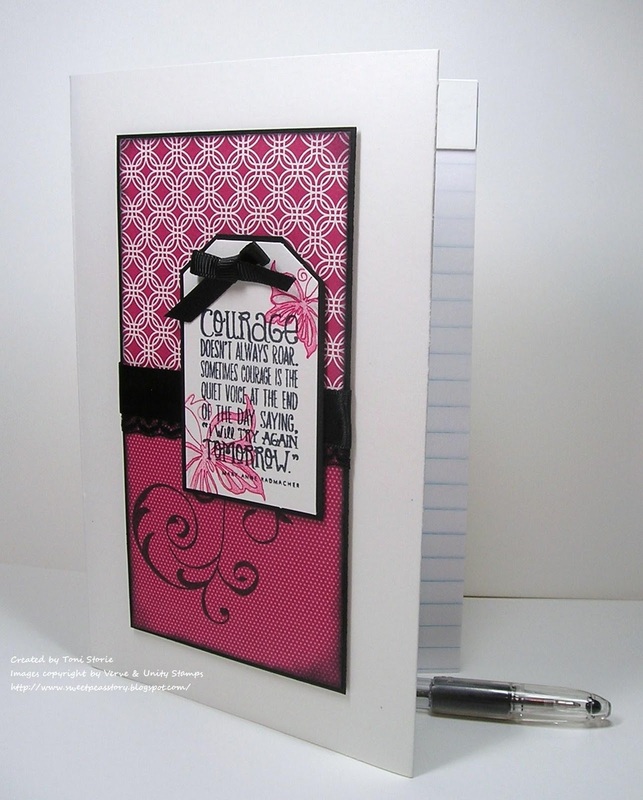 Scor-pal & Authentique Paper Blog Hop!